Pueblo Sin Fronteras, the group in charge of the annual "migrant caravan," launched its effort during Holy Week by invoking the Stations of the Cross with biblical costumery and prop crosses. When they're not serving as human traffickers masquerading as human rights activists, these travel agents for amnesty busy themselves constructing shelters along their illicit pathways that span the globe. Catholic groups have sponsored and subsidized such nation-sabotaging campaigns for decades. 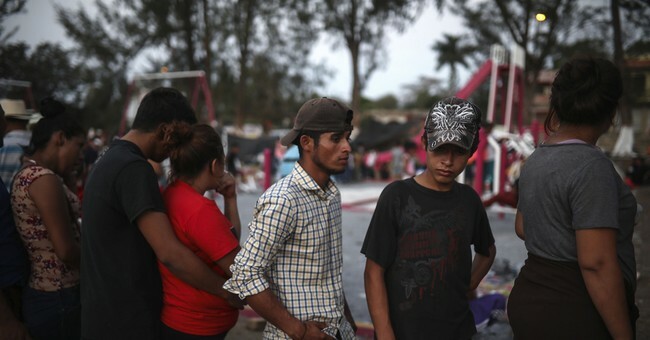 The Vatican itself donated at least $20,000 in 2009 to erect a shelter for Central American illegal aliens sneaking through Ixtepec, Mexico, where they hopped on freight trains into our country. Another papal society, Catholic Extension, has poured more than $12 million dollars into ministries along our southern border over the past five years "to ensure that those who are on a journey are protected by the Church and that we advocate on their behalf," according the Catholic News Agency. In Colorado, five illegal aliens have taken sanctuary in houses of worship in the outlaw safe spaces of Mancos, Denver, Carbondale and Boulder -- more than any other state. Each had multiple bites at the legal apple that stretched out for years. Our immigration courts heard their cases, rejected their appeals, turned down the appeals of their appeals and ordered them to leave. Religious groups have provided lawyers and media relations consultants every step of the way. In Washington state, the Jesuit-affiliated St. Joseph Catholic Church of Seattle blasted President Trump's "destructive and brutal" immigration enforcement and declared "our unwavering solidarity with our brothers and sisters in the immigrant community." All deportations violate "Catholic Social Teaching" and "the common good," the parish asserted. In Manhattan's Upper West Side, the Fourth Universalist Society of New York is harboring a mother and her family who've lived here illegally for more than a dozen years and feel entitled to flout their deportation orders. In Springfield, Massachusetts, the South Congregational Church is shielding a Peruvian woman and her two children facing deportation. Mayor Domenic Sarno has called on the city council to revoke the church's property tax exemption so that no "public dollars shall be allocated for the purpose of interfering with the religious freedoms of South Church in accordance to our Constitution." In response to a rare public official taking his legal and fiduciary responsibilities seriously, the church's leader condemned Sarno's soul. In San Diego, Catholic and Episcopal leaders united to protest construction of the border wall while waving Mexican flags. "Jesus said we should love our neighbor," one argued. True, but Scripture also teaches citizens to honor the rule of law and secular authorities who preserve and defend civil order and safety: "Let every person be subject to the governing authorities. For there is no authority except from God, and those that exist have been instituted by God. Therefore, whoever resists the authorities resists what God has appointed, and those who resist will incur judgment" (Romans 13:1-7). The Acton Institute's Brooke Levitske put it more bluntly: "Christ expected his followers to treat criminals in prison the way they would treat him, but he said nothing about busting them out of prison." As a Catholic who believes in strict immigration enforcement, I have argued repeatedly that it is one thing to show compassion to legal immigrants, legitimate refugees and asylees, and those abused and mistreated by smugglers. It's quite another to conspire against an orderly immigration and entrance system that imposes commonsense limits, eligibility requirements, criminal background checks, medical screening and a commitment to assimilation. We reserve the right to regulate entry into our country for the same reasons the Vatican itself has high barriers, armed guards and metal detectors. Yet, Pope Francis has lambasted President Trump and our walls as "not Christian." If you don't like our laws, change them. If you can't respect our sovereignty, go organize a caravan of alien trespassers and seek permanent shelter at the Sistine Chapel. Good luck with that.